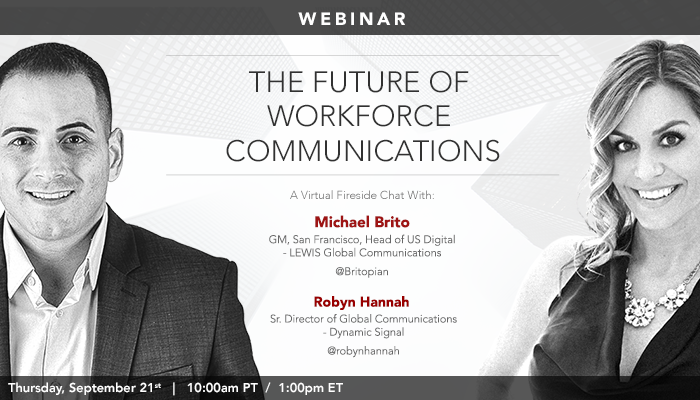 The Future of Workforce Communications is Now! Digital Transformation. Future of Work. Enterprise 2.0. All buzzwords from the past and present that are meant to describe the evolution of business today. Whatever you believe is the best way to describe this dynamic and exciting change, it’s clear that the future of workforce communications is in the driver’s seat, both internally and externally. Internally, teams must be open and transparent about the projects and programs they are working on. Doing so and by inviting feedback and collaboration with other teams will accelerate the innovation process. Whether it’s bringing products to market faster, responding more efficiently to customer issues online or engaging with external influencers, the benefits of an engaged workforce will return dividends for years to come. This doesn’t just start with leadership either. This is everyone’s responsibility. Externally, both large and small companies are now being required to engage in multi-stakeholder conversations. This means that companies must think beyond the traditional methods of communications and marketing. Today’s dynamic calls for an ecosystem that connects customers, employees, prospects, influencers and even the media to engage in conversations that matter. The universal reason why is clear. Trust. Customers, the media, influencers don’t trust branded communications anymore. They trust and relate to people. It’s part of our DNA. In my next book, Participation Marketing (available in January 2018), I talk in great detail about the internal requirements of building an engaged workforce and all the great benefits that go along with employee engagement. I also deep dive into how an engaged workforce can blossom into brand storytellers in order to reach new audiences and influence the conversation. But until then, I’ll be discussing many of these same issues in an upcoming chat with Robyn Hannah of Dynamic Signal on Thursday, September 21 at 10AM PT. As the Head of US Digital Marketing at LEWIS Pulse, I am responsible for helping clients reach their target audience with precision - the right content, at the right time, in the right channel and to the right audience. This requires a combination of audience intelligence, creative content and targeted paid media. Previously, I was the Head of Social Marketing at W2O Group, and Senior Vice President of Social Strategy at Edelman Digital where I consulted for Fortune 500 companies implementing integrated content and digital marketing programs, globally.